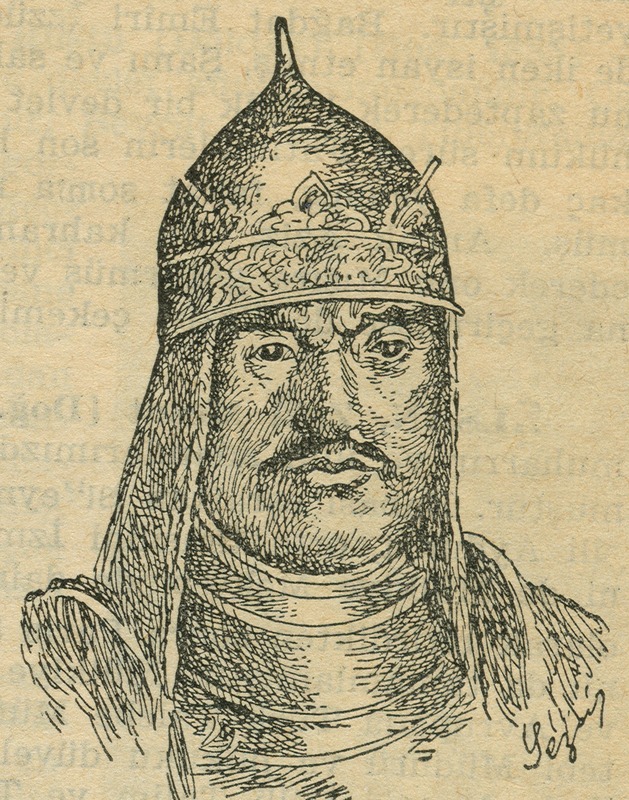 Second sultan of Great Seljuk Empire (B. January 20th, 1029 – D. September 25th, 1072). He was the son of Çağrı Bey, Melik of Khorasan, and was from Çağrı Bey’s last wife. 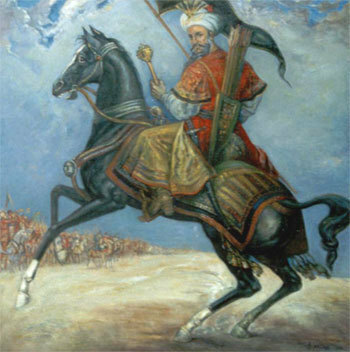 He ascended to the throne as second sultan of Seljuk Dynasty after his uncle Tuğrul Bey on 27th of April 1064. The 12th and 13th century historians had cited the date of his birth as 1032-33; the later sources cited it as 1029-30. İbnü’l-Esir, who was one of the most reliable historians, cited the date as 1st Muharrem 420, i.e. January 20th, 1029. 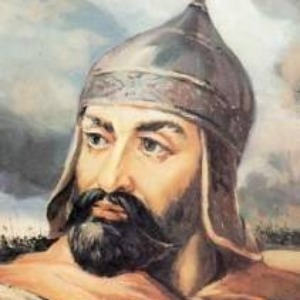 Upon his father’s illness Alpaslan halted the attacks of Ghaznavids by taking over the rule of the state when he was very young. 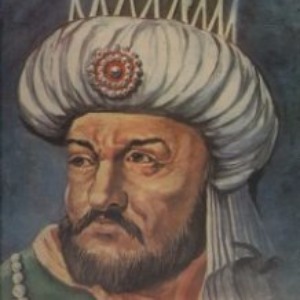 The victories he won against Karakhanids (1049) and Ghaznavids (1058) while his father was still alive, allowed him to gain reputation in the Khorasan Seljuks, whom he ruled as the heir in the last years of Çağrı Bey, and even in the entire Seljuk territory. For this reason, he became the Melik of Khorasan upon the death of Çağrı Bey in 1059. Alpaslan, refused to accept the sultanate of Süleyman who was ascended to the throne by Sultan Tuğrul’s will, Since Sultan Tuğrul died without leaving a son and began to struggle. He had to go against the emirs of Huttalan and Sâgâniyan and his uncle Inanç Yabgu, who revolted all upon the death of Tugrul Bey. 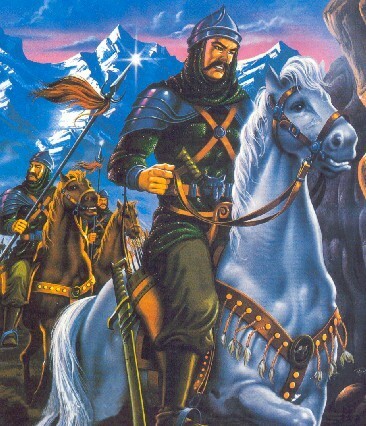 Alpaslan, who discouraged Inanç Yabgu by defeating him and left him at his own place, moved to Rey, the capital of the empire, with a huge army after suppressing the rebels. However, during the delay caused by these occupations, Kutalmış, who declared his sultanate by having a khutbah given in his name, moved towards Rey with his army of 50,000 men and put the confronting forces to rout. As for Süleyman, he initially left Rey then retreated to Shiraz after noticing his weakness compared to his rivals, who hadn’t accepted his sultanate. Kavurd, the Melik of Kirman, who came near Isfahan, upon Alpaslan’s entry to the government, returned to his lands and had a khutbah given in the name of Alpaslan. After Alpaslan ascended to the throne and minted coin having a khutbah given in his name, his sultanate was approved and announced by the Abbasid Caliph Kâim Biemrillâh. During his reign, Alpaslan gave more weight to the western expansion of the empire; organized campaigns in the west for conquests and in the east for securing the order. The main reason was that East Anatolian high plateaus, which were discovered during the expeditions on Byzantium forty five years ago by his father Çağrı Bey, were assumed to be the best place for settling Turcoman. These Turcoman, who spread to all over the Seljuk territory and occasionally caused some social distresses with the ceaseless ongoing migrations since the beginning of the 11th century, had to be settled in a country, which fit the conditions they were accustomed to. Alpaslan moved from Rey to Azerbaijan with Malik-Shah, whom he loved the most amongst his children, and with Nizam’al-Mulk, his former vizier whom he brought from Khorasan. By continuing the conquests along the path to Eastern Anatolia, he besieged Ani, the best guarded city of Byzantines in the region. On August 16th, 1064 the city was captured by Seljuks. 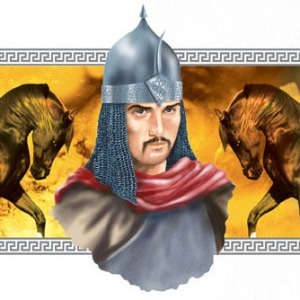 When Alpaslan was informed that Kavurd, the Kirman Melik, had adopted a rebellious attitude, he returned to Rey, leaving the campaign on Eastern Anatolia incomplete and then in December 1064 he went to Hamadan. After Kavurd begged his pardon, Alpaslan went to Merv where he lived while he was the Melik of Khorasan and spent the winter there. 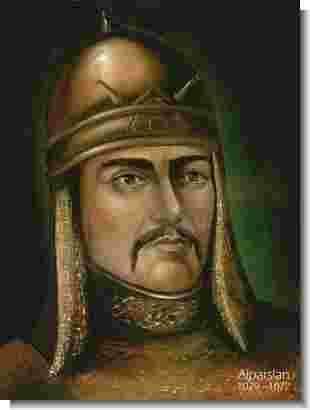 At the beginning of 1067, Kavurd, the Melik of Kirman, revolted again. Forgiving his elder brother was an indicator of the fact that he tried to enchain him by showing kindness. 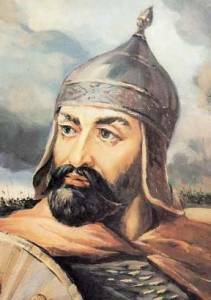 But, since Kavurd and others revolted again, Alpaslan advanced on Caucasia for the second time in the beginning of 1068. His purpose was to annex Azerbaijan the way it couldn’t be the source of unrests. The advance of the Turks on Anatolia continued, despite both Caucasian and Eastern Anatolian campaigns of Alpaslan were left incomplete. Meanwhile Byzantines, who began to notice that campaigns of Turcoman posed an obvious threat for The Byzantine Empire, considered Roman Diogenes, who was crowned in 1068, as a savior. While the events in Anatolia led to the inevitable Roman Diogenes vs. Alpaslan encounter, Alpaslan was occuppied with Syria and he aimed to pull down the Shiite Fatimid government in Egypt. Nasırüddevle, Hamdanid ruler, who wanted Syria to join the Seljuk Empire, asked for help from Alpaslan against Fatimids. Seizing this opportunity, Alpaslan, who moved with a big army in July, 1070, captured the castles of Manzikert and Erciş and came near Urfa by moving to the provinces of Meyyâfârikin (Silvan) and Amid (Diyarbakır) (October 1070). After capturing the Byzantine castles, he headed towards Aleppo which was ruled by the Mirdasid dynasty. Meanwhile, while Alpaslan was planning to advance on Damascus, a Byzantine ambassador informed him that the Emperor wanted to give Menbic in return for Manzikert and Ahlat. Alpaslan rejected this offer and relying on the report, which said that there was no serious Byzantine danger in Anatolia and which was given to him by Emir Afşin who returned to Ahlat from Western Anatolia, he didn’t make any alterations on his plan. However, during those days, he got the word that Diogenes moved to Anatolia with a huge army. Alpaslan moved to Mosul on April 6th, 1071, leaving a part of his army to ensure the conquest of Damascus. The unprecedented equipment of Romanos Diogenes’ army of 200,000 men army, which he formed by gathering reinforcements while he was moving to Anatolia indicated that the Byzantines came to Anatolia with all of their strength to say their final words. The pitched battle fought on the plain of Manzikert on August 26th, 1071, on Friday, was indeed the battle of final word. The great victory that Seljuks achieved opened the gates of Anatolia for Turks and determined the future of world history. The Seljuk army, which was formed by even the forces of Artuk, Mengücük, Saltuk, Danishmend and the other lords of the Turkmen, yet that estimated had manpower of only one-quarter of the Byzantine forces, achieved great success in this war, because the army had the high morale and tactical superiority. The Byzantine forces consisted of the forces of Frank-Norman, Bulgarian, Slavic, Pecheneg (Kuman), Uz (Oghuz), Georgian and Armenian, who didn’t have unifying elements such as language, religion or a common goal and who were constantly fighting each other before. While the biggest part of the Byzantine army consisted of mixed mercenaries, the Seljuk army consisted of only Muslim Turks and Muslim Kurds who helped them and these soldiers didn’t fight for a pay. Likewise, while there was a variety of differences of opinion, personal feelings of hatred and envy between the Byzantine commanders, the Seljuk commanders were persons like Sav Tegin, Ay Tegin, Porsuk and Gevherâyin, who were clamped together around Alpaslan since his enthronement. The fact that the Byzantine army, which was fighting the battle with its mass, had poor maneuverability and was formed of heavy-equipped troops and that the Turkish forces were formed of almost entirely light, highly maneuverable cavalry battalions had a great impact on the course and outcome of the battle. The most important factor that played a role in the defeat of the Byzantines despite their superior forces was the battle plan that Alpaslan implemented. Alpaslan used a tactic that had been used by the Turks throughout the history in both the wars fought on land and on the water; in this tactic, weak but fast-moving forces, which are placed in the center, supposedly fall back and the enemy, who attempts to chase these forces, gets flanked between the forces on either side and the retreating forces quickly turn back to encircle the enemy. Alpaslan achieved success easily by using this tactic as Byzantine troops could not maneuver swiftly. Alpaslan treated the defeated Byzantine Emperor like a guest of honor. A friendship between the two rulers was established, and a peace treaty was signed of which the text doesn’t exist today. However, the provisions of the treaty couldn’t have been implemented since Roma­nos Diogenes was dethroned in his absence and after a while fraudulently captured, died by his eyes being carved (August 4th, 1072). When Artuk Bey was getting ready to invade Anatolia, Sultan Alpaslan moved to Transoxiana with an army of 200,000 men. 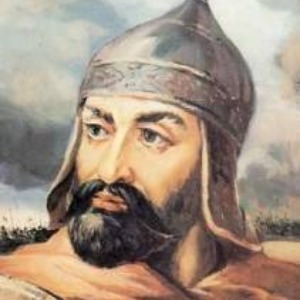 The fact that Alpaslan went on an expedition for the first time with this many men can be explained by his intention to completely wipe out the Karakhanids this time. However, the assassination of Alpaslan rendered the expedition inconclusive and that reversed the situation and attacking Karahanlılar by taking Tirmiz and passing over Amu darya, he came to Balkh. When Alpaslan, without a major resistance, proceeded through the territory of the Karahanlılar, he was severely wounded with a small dagger kept in the boot by Yusuf Al-Khwarizmi (Barzemî) the commander of Fort Barzan, who surrendered after a short resistance and he died as a martyr four days later (November 24th, 1072). Alpaslan, who is considered as the ancestor of the Western Turks, had a grandeur, bold, brave and mighty personality as clearly shown by the given title, the epithets, and descriptions and as stated by the consensus of opinion among Arab and Byzantine historians. Besides his monumental physique he was renowned for being just, as can be seen from his attitude towards his elder brother Kavurd and Romanos Diogenes, whom he showed that he was forgiving and tolerant. He was a quite a devout Muslim and was known as a faithful practitioner of religious provisions. This aspect of him raised him to the degree of a velî (T. N. Muslim Saint) in the heart of the public, led him to be attributed to many miracles. It was recorded in ancient history that in his palace there was an imaret where fifty sheep were slaughtered every day and that he gave some spending money to the poor whose names were organized in lists. Almost every city in the countries, which Islam had not influenced yet, he built mosques; it was known that he managed the reconstruction works, for which he could not find enough time to deal with due to military works, and social activities such as gathering the artists, scientists and intellectuals and putting them under the protection of the government through his vizier Nizam’al-Mulk. The large number of gold coins he minted shows the economic growth and prosperity of the era. REFERENCE: Mükrimin Halil Yinanç / Selçuklular Devri: Anadolu’nun Fethi (1944, s. 57-85), Ebü'l-Ferec / Târih (Çev. Ömer Rıza Doğrul, 1945), Fahrettin Kırzıoğlu / Kars Tarihi (1953, s. 337-354), Osman Turan / Selçuklular Tarihi ve Türk İslâm Medeniyeti (s. 97-140, 1965) - Selçukluların Ani’yi Fethi ve Buradaki Selçuklu Eserleri (Selçuklu Araştırmaları Dergisi, 1970, s. 111-139) - Selçuklular Zamanında Türkiye Tarihi (1971, s. 19-37), Ali Sevim / Biyografilerle Selçuklular Tarihi (1982), Mehmet Altay Köy­men / Alp Arslan ve Zamanı (c. I-II, 1983), TDV İslâm Ansiklopedisi (1989, c. 2), Ali Çimen / Tarihi Değiştiren Askerler (İst.2007, s. 84), Prof. Dr. Faruk Sümer - Prof. Dr. Ali Sevim / Malazgirt Savaşı (TTK yay., 1988, s.38), Abdurrahim Tufantöz.Ortaçağda Diyarbekir (Akçağ Yay., Ank., 2005, s.110), İhsan Işık / Diyarbakır Ansiklopedisi (2013) - Ünlü Devlet Adamları (Türkiye Ünlüleri Ansiklopedisi, C. 1, 2013) - Encyclopedia of Turkey’s Famous People (2013).